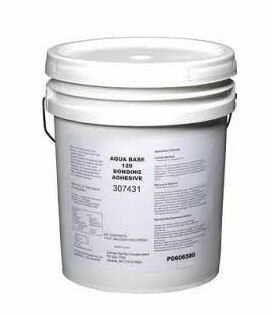 PRODUCT: WeatherBond AQUA-BASE bonding adhesive #120. For EPDM/TPO/PVC. Very low VOC, meets SCAQMD and all regions. Non-flammable. 5G Can. Price/Can. (special order; shipping leadtime 1-3 weeks). DESCRIPTION: Weatherbond #120 Aqua Base Membrane Bonding Adhesive is a pressure-sensitive water based adhesive. This product is used as a two-sided solvent free contact adhesive. It is compable with EPDM, TPO and PVC membranes. Aqua Base 120 Bonding Adhesive is approved for use on Polyisocyanurate, Recovery Board, Dens Deck Prime, OSB, plywood, cellular lightweight, and structural concrete. COVERAGE RATES: Coverage rate is 100 - 120 square feet (11.6sq m) per gallon per surface when used as a contact adhesive and applied on both the membrane and substrate (100 sqft per finished area). This coverage rate is an average and may vary due to conditions such as insulation type or wall construction. The surface, on which or against the adhesive is to be applied, shall be clean, smooth, dry, and free of fins, sharp edges, loose and foreign materials, oil and grease. Depressions greater than 1/4" (6 mm) shall be feathered; using epoxy, mortar or other approved patching material. All sharp projections should be removed by scraping, sweeping, blowing, vacuum cleaning, etc. Stir until settled material or phased liquid is redistributed and the adhesive is uniform in color. Apply adhesive to the substrate in a uniform manner avoiding globs, puddles, and uncoated areas. Squeegee Application - Apply with a 1/8" notched squeegee to attain specified coverage rate. Roller Application - Use a medium nap roller. Mechanical Roller Application - Follow the manufacturer's safety and use procedures. Mechanical Spray Application - Follow the manufacturer's safety and use procedures. Tip sizes between .019"-.023" in a Graco 510 gun. A minimum fluid pressure of 2,500 psi is required for a fair pattern. Flush with water at the end of the day. EPDM, PVC and TPO Membranes (2-sided contact adhesive): Apply Aqua Base 120 Bonding Adhesive to the membrane and the substrate at the recommended rate. The adhesive must be allowed to dry until the adhesive does not transfer to a dry finger touch or pull away from the membrane. The dried adhesive should remain tacky before assembly. Mate the membrane with the adhesive coated substrate, while avoiding wrinkles. Immediately broom the bonded portion of the sheet with a soft bristle push broom to achieve maximum contact. The adhesive contains no solvents to react with the membrane therefore brooming the sheet is critical. Extended drying times can be expected in cool, overcast, humid, shaded or late day applications. The adhesive must be dry to avoid permanent blisters from trapped moisture. Coated areas exposed to moisture shall be allowed to dry and then recoated. All adhesive residues in the splice area must be removed. Squeegee, 18 Inch Wide Wide X 1/8 Serrated (v-notched) Gray EPDM Rubber Straight Squeegee. Replaceable Blade Set In Steel Frame. Recommended For Use With Deck Coatings. Price/each.